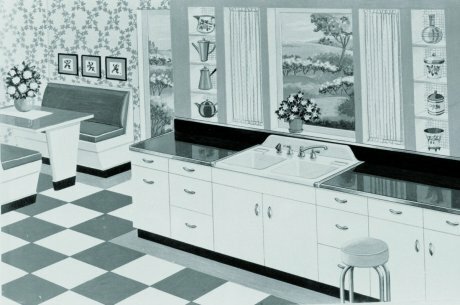 Let me take you on a little stroll though kitchen design history from the 1930s though the 1950s — with this terrific series of images from Kohler. 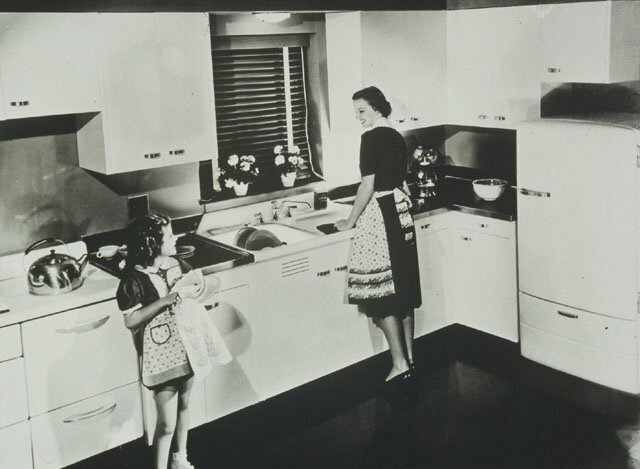 Vicki Hafenstein of the media relations team at Kohler is really helpful and responsive, and quickly supplied these vintage kitchen photos and illustrations to help with the etsy.com video. She is also hunting some pink bathroom illustrations for my talk in Charlotte. I really appreciate your help, Vicki! Oh, and have I ever mentioned that when I found my 67 vintage Geneva steel kitchen cabinets, the former cooking-school set also came with four vintage, 42″ wide, double-bowl, hudee-ringed Kohler sinks? One is now installed in my kitchen. These first three images show old, farmhouse style sinks. I don’t really understand the design evolution of sinks. I am pretty sure they were all heavy cast iron, because that was the dominant metal-making technology. Honestly, these have kind of a “trough” feel to me, I am guessing they are in fact derived from designs originally used on farms. I need to do more research… The design above shows how the sink was not necessarily integrated with the cabinets. 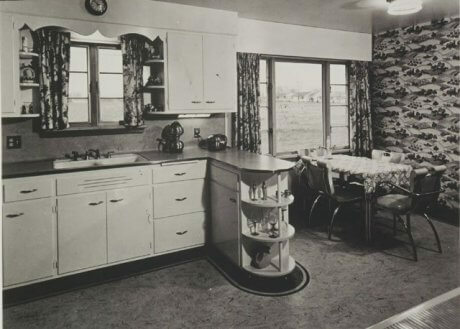 Here we have a little evolution – the sink at least is tucked along the same wall as the cabinets, and it has legs. Look at the deep bowl, which also has a hinged top. 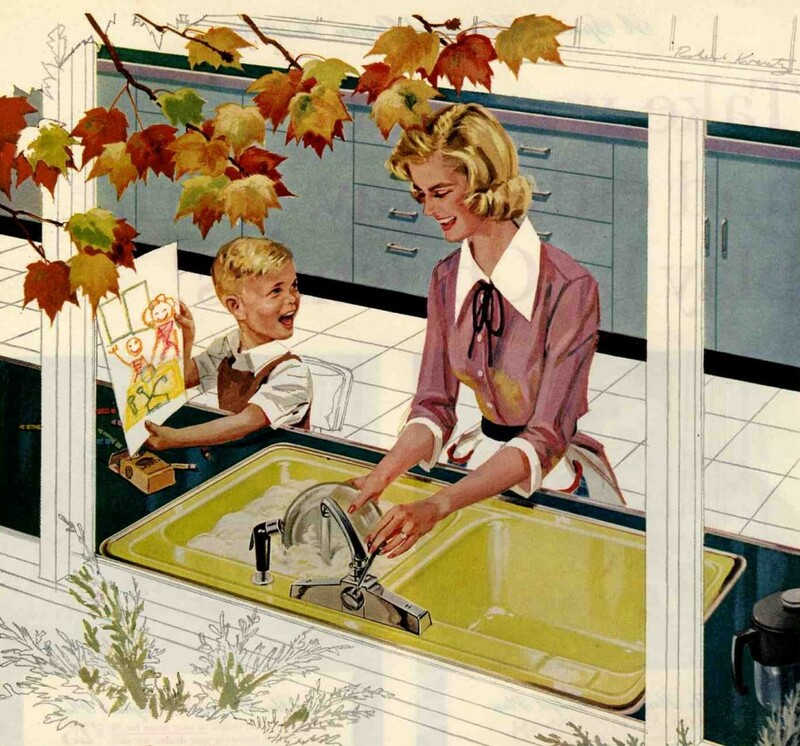 I love this illustration, which I am guessing comes from the 40s, I’d say. 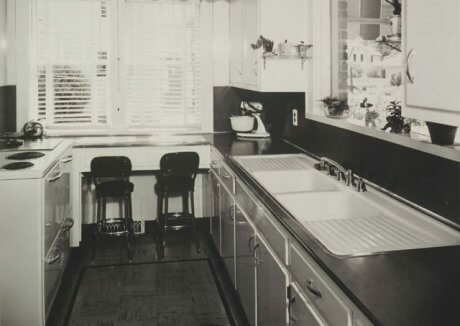 The way the linoleum (probably) counter is fitted to the sink — with that stainless steel strip — is a giveaway that this is an earlier-postwar-era kitchen. 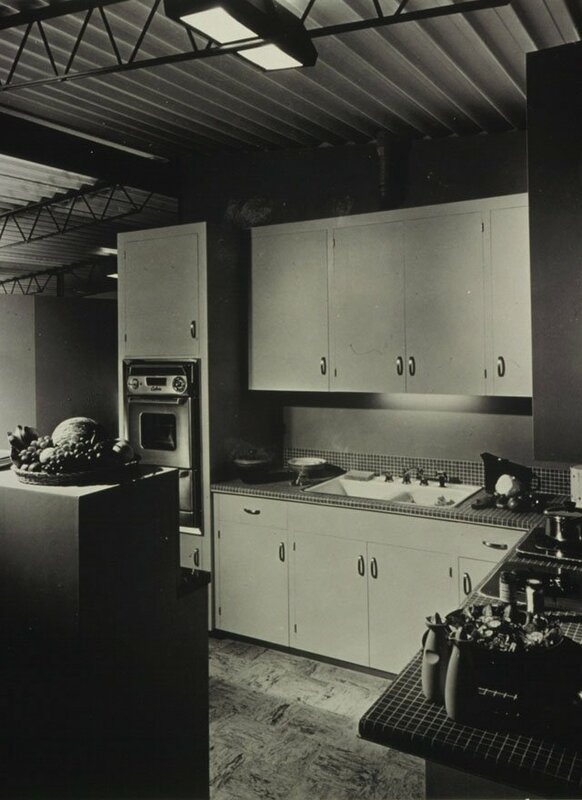 Did you know that Kohler also made steel kitchen cabinets at one point? I am pretty sure these are theirs. 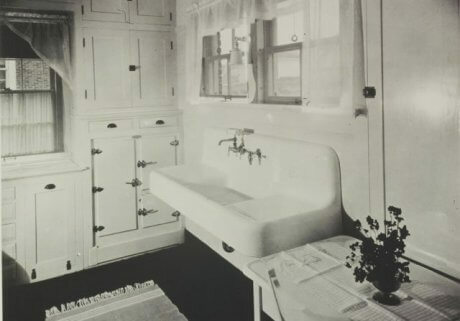 This looks to be the same sink as the one above – without the drainboards. Late 40s and early 50s kitchens were much more likely to have built-in banquettes or dinettes and such. Kind of a carryover from bungalows. As kitchen design progressed, it seems we moved to stand-alone dinettes. Maybe this derives from the fact there could be less craftsmanship as housing construction boomed. 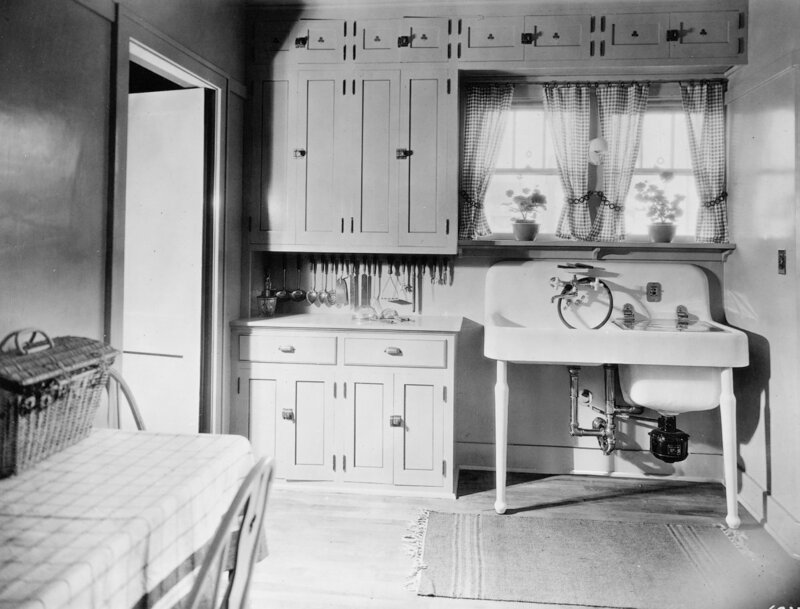 Bungalows were part of the “arts and crafts” era — a return to hand-made and craftsmanship in a backlash response to mass industrialization during the Victorian era. With the etsy.com handmade movement today, I think we are seeing a bit of this same sentiment. 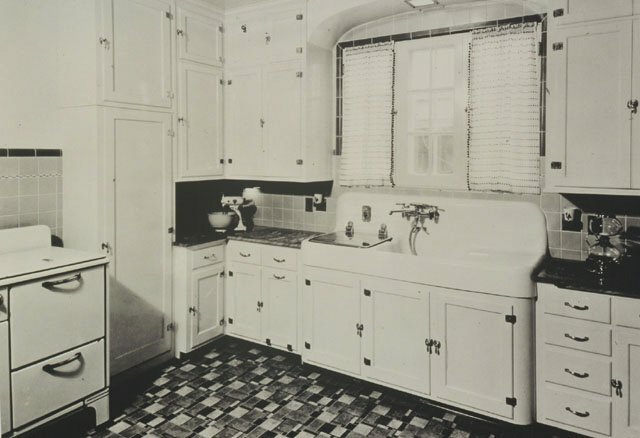 The same kitchen, perhaps — but in a real-life installation (as opposed to an illustration). Ahhhh, notice that the sink has “lost” its integrated backsplash, and it’s set into the laminate countertop with its metal hudee ring. More design evolution. It’s like… monkees losing their tails and becoming… human! 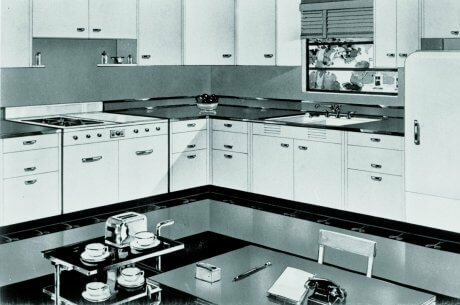 We are into the heart of 1950s kitchens now, I think. Woah, look at this beauty! Early 50s? 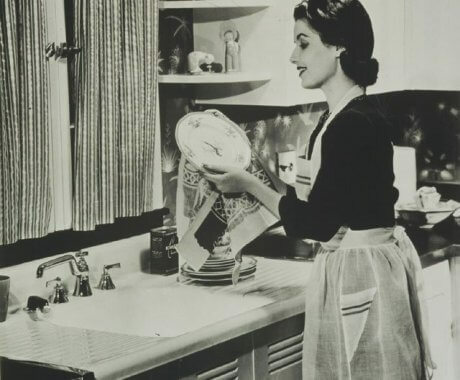 Honestly, I don’t cook much, BUT it still seems that I am doing dishes all the time. 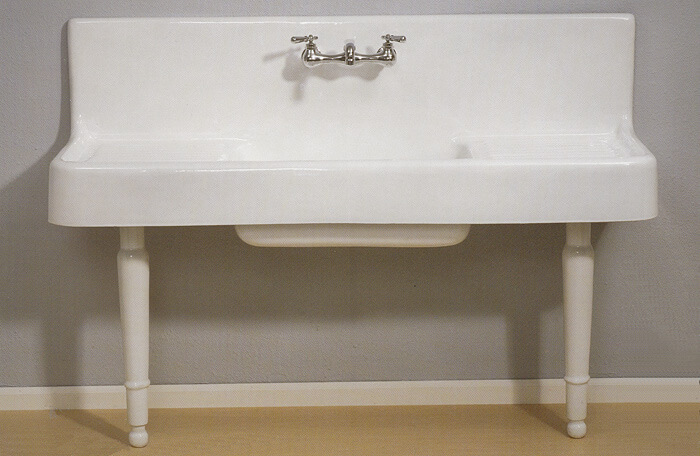 I would REALLY love to have drainboards like this to the left and to the right. So practical for managing the dishes piling up, going through production, then over to drying. Like this! Except that today, we compost all of our carrot peelings. Right, people?! 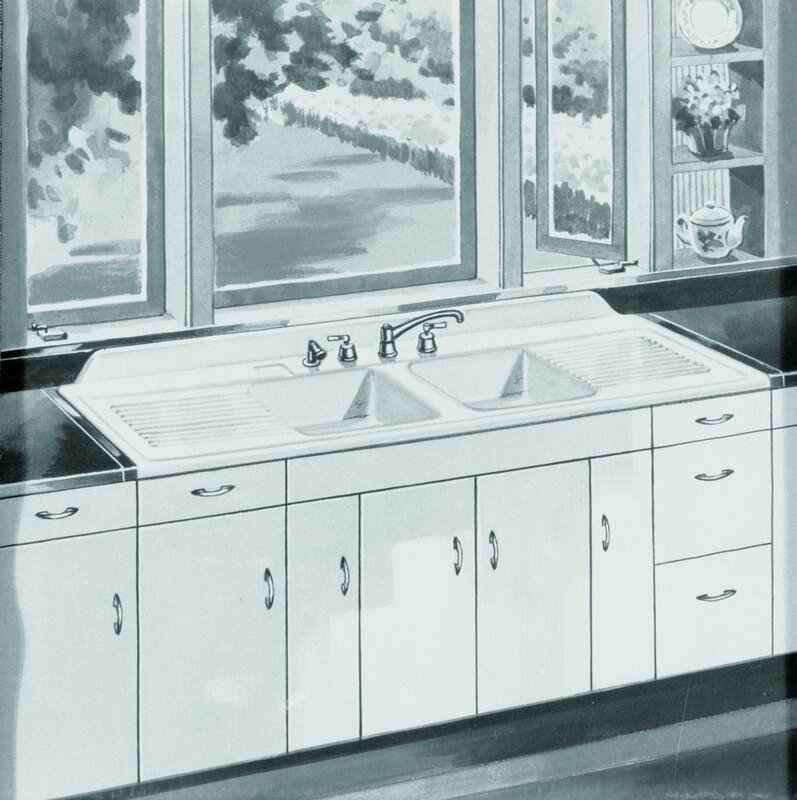 Obviously, it’s impossible to say because this is a black-and-white photo, but: That sure looks like a colored sink to me. Let’s guess. 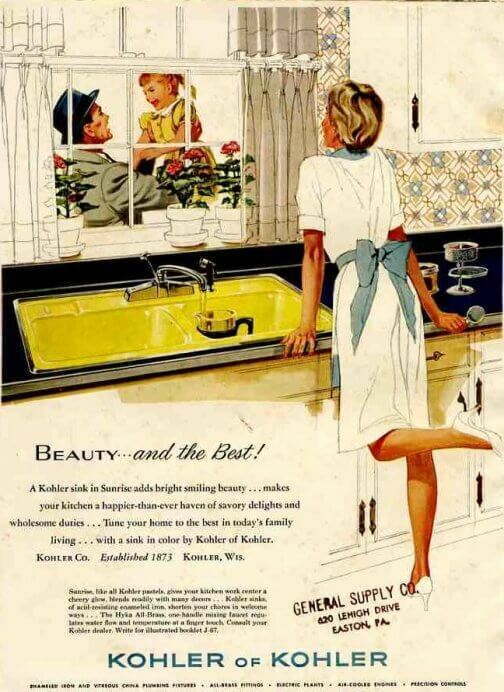 This is one of the two images from my collection of vintage Kohler ads. Gorgeous mid-century kitchen, isn’t it? And this colonial modern Kohler kitchen (also from my collection) — one of my favorites of all time, truly. Modern! Can anyone give me a date based on the oven? 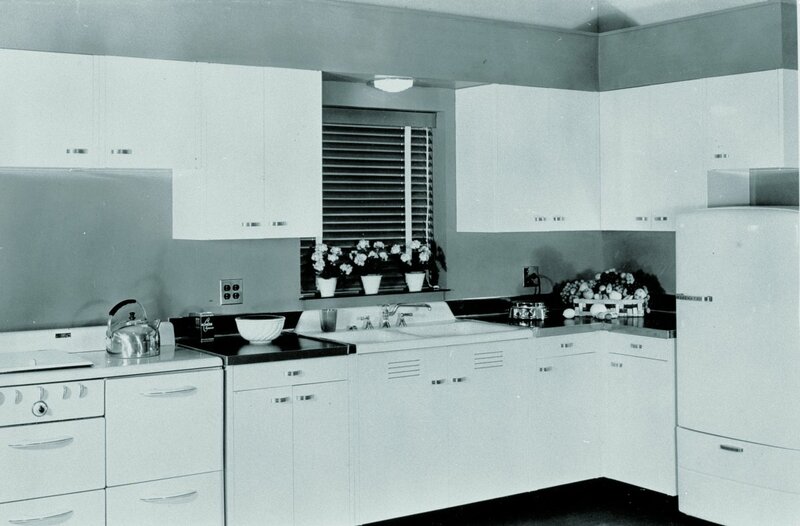 You can see all my product finds to design a mid century kitchen over on my Kitchen Categories. I just bought a house built in 1957 in Gainesville, FL. I have the sink above with the drainboards to left and right of sink. Out of all the kitchen bids, only 1 contractor was willing to work around it and build a kitchen that incorporates this giant sink. He’s obviously the one that we are using! I am excited for it! Can you show and tell how you did it???? Lisa: Please contact a professional to help you. 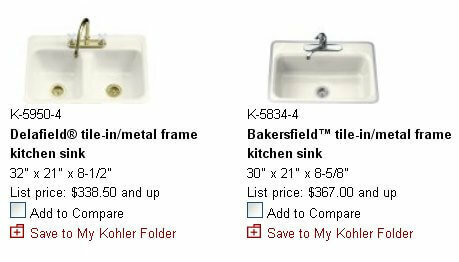 It’s possible Kohler may still have instructions — try them. 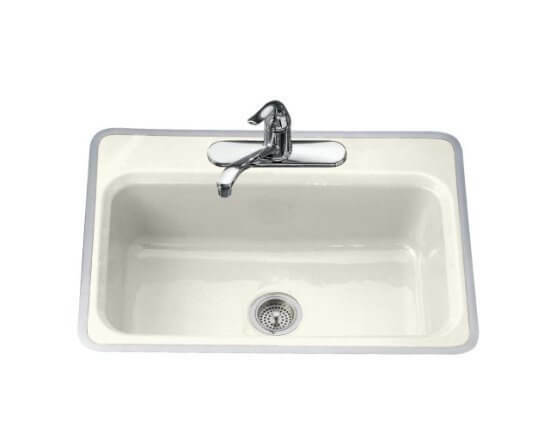 I have two double drain board farmer sinks and a single drain board sink I am trying to move out of my garage. From Cape Cod Massachusetts. Hi Kurt — put them on craigslist. No buying/selling here on the main blog. Pam – this would be a perfect site for those who wish to buy or sell. If not you then who? Do you still have the sink? Me, too. I live in the middle of the country (Missouri) , so am hoping that expands my list of buyers, without my having to let a dealer sell it for 2395.00 as I have seen (my exact sink) go for an resale sites. It just takes a little longer because most people aren’t usually searching Craigslist for high-end items–antique or not. Mine came with the house, where some idiot had “updated” the kitchen, and has been garaged, in pristine condition, waiting for me to finish grad school, so I could afford to reinstall it. Instead, due to illness, I am selling the house, and having to leave my sink behind. I want it cherished by someone who appreciates beauty, quality and the best of the past. Maybe these guys can install it for my buyer, who will want their skills level. I think that folks looking for hard-to-find vintage stuff like sinks and appliances are watching craigslist like hawks. The reason that resale sites can get more money is that they are generally legitimate businesses that invest a lot of time and money aggregate stock, repair it, etc., then have a lot of options to choose from — if you are looking for something specific, they do the work for you, including holding inventory. Running businesses like that costs money…. so the products for sale need to reflect those costs. On the other hand, it costs literally nothing to buy/sell on craigslist, so folks expect a deal. J am trying to find some one to reporcelian a steel sink from 1950. I have called Independence Porcelain Enamal in Independence MO and Custom Ceramics in Lentberg IL and neither company will call back. Does anyone know of a company that I can call? Those are the two companies that I know of. 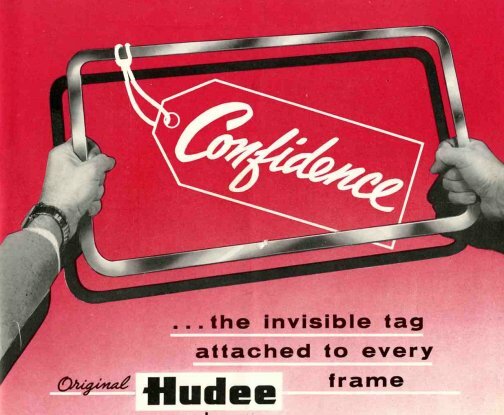 looking for lg vintage sink/drainboard to be hipped to vieques, P.R. 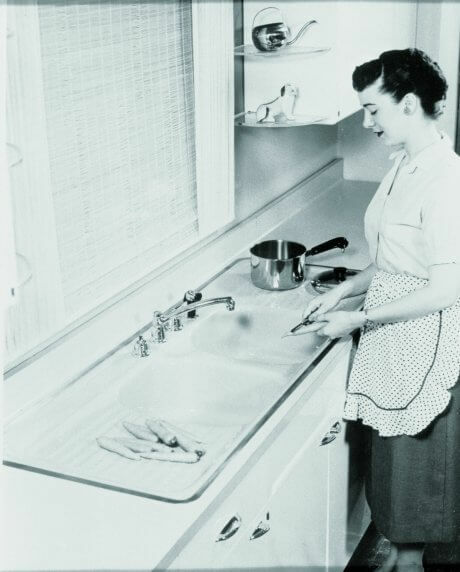 Just an FYI, the third sink down, with the legs–the right side is an early version of the dishwasher. The lid and buttons on the backsplash, as well as the mechanicals underneath are all tip offs.